60"W. Mobile Bench Cabinet with 6 Drawers. All welded, heavy-duty 16 ga. steel construction. Durable gray textured powder coat finish. Ladder hanger accommodates 6' ladder. 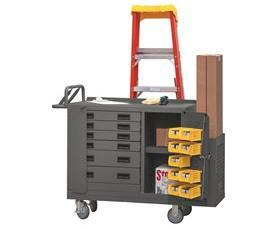 Unit ships fully assembled and features top surface backstop. 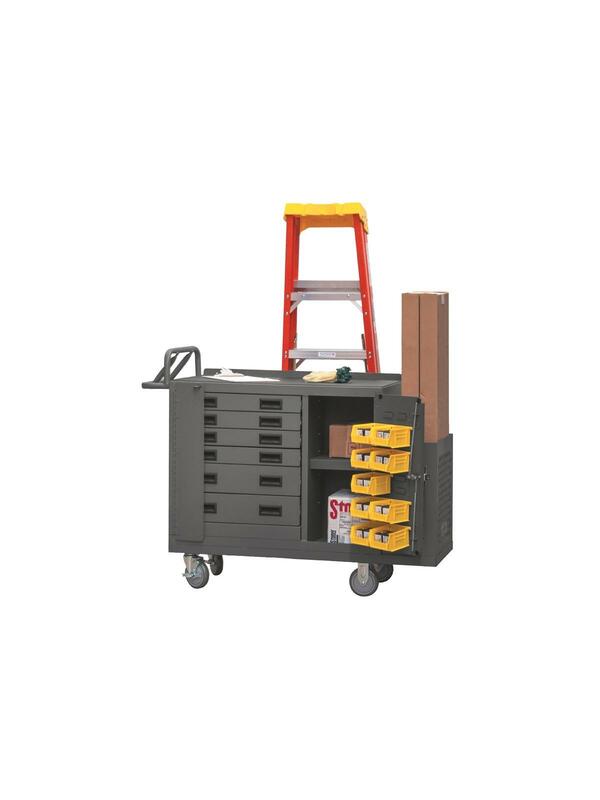 Convenient sturdy work surface is covered with a black rubber mat. Louvered panels on the door accommodate Hook-On Bins® and the cart comes complete with 9 Hook-On Bins®. Door has a 3-point locking system and a fold down padlock ready handle. Locking hinge is also provided to lock all drawers at once. Drawers move smoothly on bearing slides. The ergonomic tubular handle makes the cart easy and comfortable to push. Rolls on 5" x 1-1/4" polyurethane casters: (2) swivel and (2) rigid. FOB Shipping Point. Handle adds 6" to width. (4) 20-7/16" x 14-11/16" x 2-7/8"
(2) 20-7/16" x 14-11/16" x 4-7/8"
48 x 18 x 36-1/2"